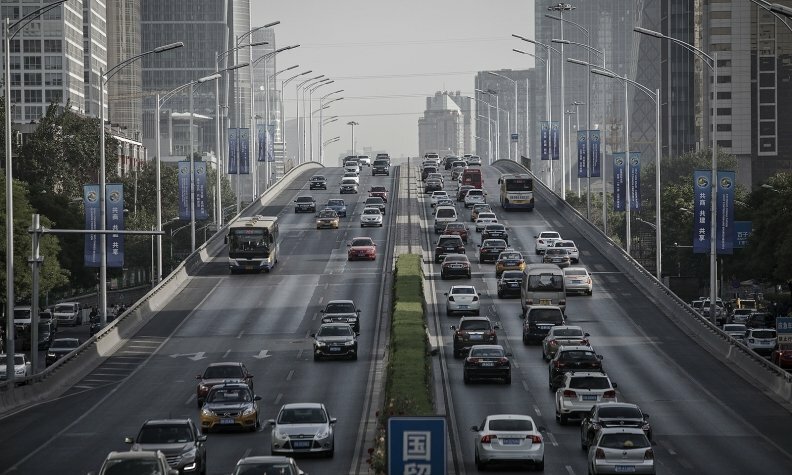 China's government is working on a timetable to phase out fossil-fuel powered vehicles on the country's roads. BEIJING -- China ordered most automakers including foreign producers such as Volkswagen Group and Ford Motor to sell a minimum number of new-energy vehicles every year starting 2019, giving them more time to comply with a key policy shift in the world's largest market. Under the so-called cap-and-trade policy, automakers will be required to obtain a NEV credit score of at least 10 percent in 2019, and 12 percent in 2020, the Ministry of Industry and Information Technology said in a statement posted on its website. Carmakers that have production of, or import, more than 30,000 "traditional" vehicles annually must comply. If they don't, companies must buy credits or face fines. Positive credits from 2019 can be carried over to the next year. China previously proposed to start implementing the policy next year, a target that was viewed by automakers as overly ambitious. China, which has vowed to cap its carbon emission by 2030 and curb worsening air pollution, joins the UK and France in seeking a timetable for the elimination of vehicles using gasoline and diesel. The country needs to use alternative energy to power some 200 million vehicles that ply its roads and reduce dependence on oil imports. "Political considerations must have weighed in on the decision to delay the commencement date by a year," said Cao He, chairman of Quanlian Auto Investment Management. "Local automakers will likely benefit from this as they will have more buffer time to get ready on the technology front." Earlier this month, China's government said it's working on a timetable to phase out fossil-fuel powered vehicles, helping lift shares of local automakers such as BYD, a carmaker that's backed by Warren Buffett. While global manufacturers from billionaire Elon Musk's Tesla to Nissan and General Motors are racing to grab a slice of the electric-vehicle market in China, local manufacturers such as Geely Automobile Holdings have also found considerable success in the market, thanks to generous government subsidies. BYD tops the new energy vehicle makers in sales in the first seven months of this year, delivering 46,855 electric and plug-in hybrid vehicles, resulting in about 30,000 credit points in the first half, according to the company's calculation. Beijing Electric Vehicle, the EV division of state-owned BAIC Motor, followed with 36,084 units. By comparison, GM has sold 738 cars that run on electricity since it launched the Velite 5 plug-in hybrid model at the Shanghai auto show this April. As part of efforts to boost sales of electric vehicles, foreign automakers are setting up new joint ventures in China. Ford is exploring setting up a joint venture to produce electric vehicles in China with Anhui Zotye Automobile, while VW has partnered with Anhui Jianghuai Automobile Group to make EVs.